The last two singles of the day at Friday’s Bank of the West Classic represented a study in contrasts. First, a labored but eventually triumphant effort from Madison Keys, the 22-year-old American beating Lesia Tsurenko 6-4, 6-3, in a match that proved once again how powerful players such as Keys often take a while to put the pieces together. Mental? Physical? Emotional? Either way, Keys remains a work in progress. The same also holds true – but in a different way – for another promising young American, CiCi Bellis. While Keys currently is akin to one of those sound systems that require a long-term strategy for assembly, Bellis arrived with the batteries included. In the manner of such competitors as Chris Evert, Tracy Austin and Andrea Jaeger, she has always conducted herself with a heightened sense of urgency and engagement. Such is the gestalt of the smaller player (Bellis is 5’ 7”), who knows that what she lacks in raw firepower she must compensate for with a mastery of the intangibles and dogged concentration. Bellis tonight demonstrated all of that magnificently with a 6-2, 6-0 win over second-seeded Petra Kvitova. Determined to, in her words, “focus on my side of the net,” Bellis showed an improved forehand. As recently as this year’s Roland Garros, the shot struck me as too flat, the swing rushed, at times even cramped. But tonight, perhaps aided by the reliable bounce of a hard court, Bellis’ forehand was far more fluid, shaped and frequently potent. “I definitely played an unbelievable match,” said Bellis, who likes to describe herself as “peppy” and “energetic,” terms personified by her these days hitting for 20 minutes after every match she plays. A good term for Bellis: problem-solver. Spit back a return. Throw up a lob. Roll a short crosscourt pass. As the comfort level increases, go toe-to-toe from the ground. Smack a serve. Sustain the intensity. Bellis summons up memories of another tenacious, undersized warrior, Lleyton Hewitt. Kvitova, imagined yesterday as an earnest music student, was on this occasion badly out of tune. She sprayed balls long, wide, into the net, a cacophony of errors. Certainly much of the credit for that belonged to Bellis. 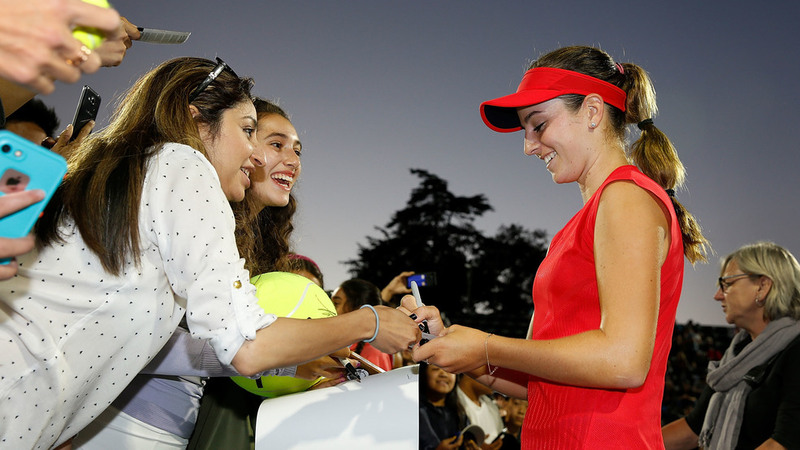 To carry the undergraduate metaphor to her side of the net, Bellis is a young English major, who here at the Bank of the West Classic has so far disposed of her opponents with pride and prejudice. Both Jane Austen and Tracy Austin would be proud.